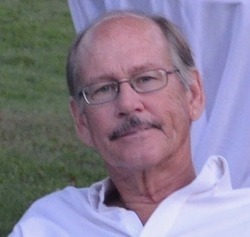 Dennis F. Mulligan, 69, of Forge Village, a.k.a. “the capital of Westford” MA., passed away peacefully on December 4, 2018, surrounded by his family. Dennis is survived by his daughters Chrissy Casey and Brenna Cotter, son-in-law Michael Cotter, his son Patrick Mulligan, daughter-in-law Caitlin Mulligan, and his beloved partner Nora Petrosene. He had five grandchildren who adored him, Devin, Bella, Lyla, Madeline and Gavin. His sister Paula Valcourt, her husband George Valcourt, his brother Michael Mulligan and nieces and nephews. His very best friends Kevin and Gina Vibert, along with a many others from his childhood in Westford to his golden years. Dennis was born in 1949 to parents Francis and Marion Mulligan of Forge Village. He attended Westford Academy, excelling in football and wrestling, as a captain in both sports. He went on to attend college at Umass Amherst, and had a career at Raytheon, and in his later years at the J.V. Fletcher library. He had an infectious sense of humor and a genuine love for life that shown through in how he treated people. Each day was lived to its fullest with moments of joy for himself and for those he interacted with. He had a phenomenal taste in music, loved fishing, gardening, brewing beer and most of all spending time with his friends and family. A celebration of Dennis’s life is being planned for a later date. In lieu of flowers please consider making a donation to the J.V. Fletcher Library Memorial Gift Account in his name. I’ll see you in the sky above, in the tall grass and the ones I love. The world is a little less bright without him here, you will be missed." In lieu of flowers please consider making a donation to the J.V. Fletcher Library Memorial Gift Account in his name.